Located on private property, 6 miles inside the southern entrance to Yosemite National Park, in the community of Wawona, we are delighted to share our vacation rental and introduce others to this special region of Yosemite. Wawona is worth a visit even if not staying here. The privately owned Cabin offers 2 bedrooms, 2 baths and sleeps up to 6. The master bedroom has a queen bed and a private bath with whirlpool tub. The second bedroom includes a queen and a twin bed. The living room hosts a comfortable queen sofa bed as well as a dramatic rock fireplace. The cabin includes a sunny 650 square foot deck equipped with a gas barbeque. A portion of the deck is covered for enjoyment in all seasons. Our cabin is pet-friendly and is also provided with satellite TV, free phone calls within the U.S. and hi-speed WI-FI internet access. The community of Wawona is located in a valley with the South Fork of the Merced River flowing through. Initially established as a stage coach stop for travelers to Yosemite Valley, Wawona was added to Yosemite National Park in 1932 with a park expansion which also included the nearby Mariposa Grove of Giant Sequoias. Today Wawona is still a quaint community and is home to the historic Wawona Hotel, a nine hole golf course, the Pioneer History Center Museum, a community library and 2 markets. The South Fork of the Merced River provides for excellent swimming and fishing as does near by Chilnualna creek and falls. 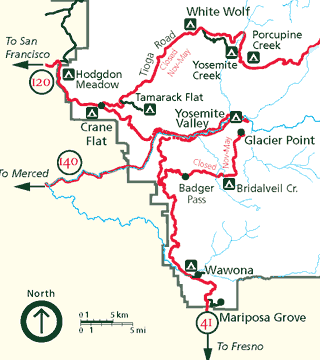 Several popular trailheads also originate in Wawona. Our cabin is available for vacation rental year round. It is professionally managed and the management company provides linens, towels, and other daily necessities. They also provide maintenance personnel, a gift shop, and check-in desk. The management company sets the rental rates and they handle rental transactions with the guest. We do wish to make sure you receive the best rates available and insure you get the most from your stay. Please use the form below to contact us with your question, comments and special requests. Thank you.